The Lockwood playground build is progressing nicely, as the photograph above shows. 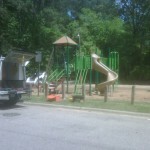 The Lions Park playground build is scheduled for this Saturday. Cindy Trumbower from the city’s Parks and Rec department reports that there are now so many volunteers that she’s having to turn people away! 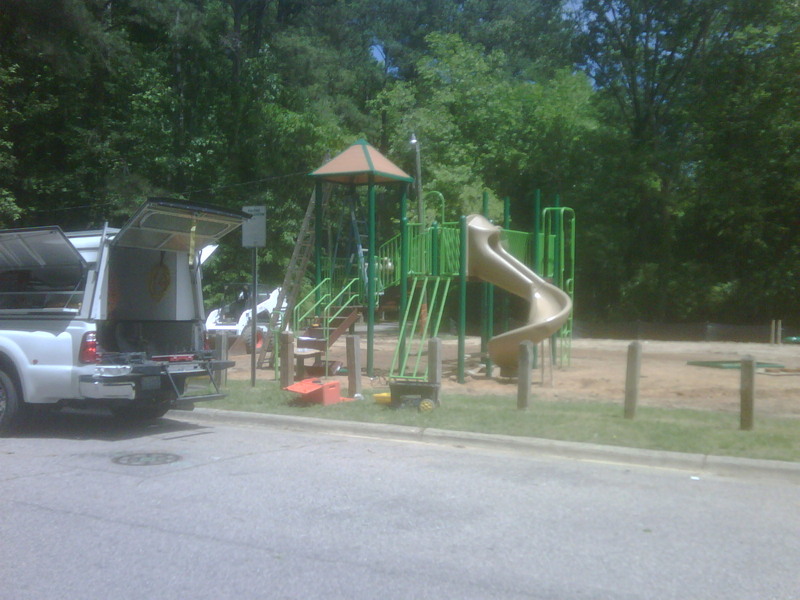 Therefore, the 60 registered volunteers will make the new Lions Park playground a reality Saturday morning. It should be fun! Audio and video from the April 2010 meeting of the East CAC is now available. Video can be streamed here. (Once again, I apologize for the poor audio quality). A number of interested parties met a few weeks ago to discuss the proposed Capital Boulevard Revitalization Study. Mack Paul reported this week that a meeting will be held next month with senior NCDOT officials to discuss what level of flexibility we have in redesigning this corridor. Also, city staff are seeking archival photographs and other information of Capital Boulevard to help document the history and evolution of this corridor. If you’ve got helpful documents or photographs, please contact Ken Bowers. It’s anticipated that the city will hold a scoping meeting in June. Stay tuned for details. You can take a look at the city’s draft Capital Boulevard Scope of Work for more information. The East CAC will meet on Monday, April 19th at 7 PM at Lions Park Community Center, 516 Dennis Avenue. The speaker this month is Bianca Howard, Solid Waste Services Education Specialist for the City of Raleigh. Bianca will provide an overview of Raleigh’s recycling efforts, including phone book recycling, Shred-A-Thon events, and the city’s upcoming transition to recycling carts. Bring your recycling questions for the expert! We’ll also hear reports from our Planning and Zoning and Economic Development committees as well as our usual announcements from our community officer and Parks representatives. Hope to see you there! Chairman Mark Turner called the meeting of the East CAC to order shortly after 7 p.m. on Monday, March 15 at Lions Park Community Center. There were about 65 people in attendance, with about a dozen attending for the first time. The meeting was recorded, and the audio will be available at www.eastraleigh.org. The February minutes were approved. ANNOUNCEMENTS: The Lions Park playground community build will be held on Saturday, May 1 from 8:30 a.m. to 3:30 p.m. People have to be at least 18 years old to participate. For details on how to participate, contact Cindy Trumbower, the Parks and Recreation volunteer coordinator, at 996-3292. Mark also noted that Census forms would be landing soon in people’s mailboxes—please fill them out and ask your neighbors to do likewise. The video from the meeting may be viewed here. The Viva Raleigh Festival will take place Saturday, April 10, from 1:00-5:00 p.m. at Spring Forest Road Park at 4203 Spring Forest Road. This will be a day long celebration of the Latino culture with music and food. We will feature continuous live performance by local and internationally known artists, sponsor booths offering free product samples and/or services, arts & craft and other organizations offering information. The City of Raleigh and a committee of city residents are organizing Viva Raleigh Festival. With this event, we want to inform, integrate, empower and involve all of the Latinos that live within the City of Raleigh. Viva Raleigh will consist of areas such as city departments, health, education and youth. For more information, contact Aracelys Torrez at aracelys.torrez [at] ci [dot] raleigh [dot] nc [dot] us or by phone at 919.996.5717.